Configurable Breath Controller with USB-MIDI class compliant interface, flexible headset and lip bite force sensitive mouthpiece. Configuration Utility and documentation available for download on the Support page. See also the Frequently Asked Questions page. 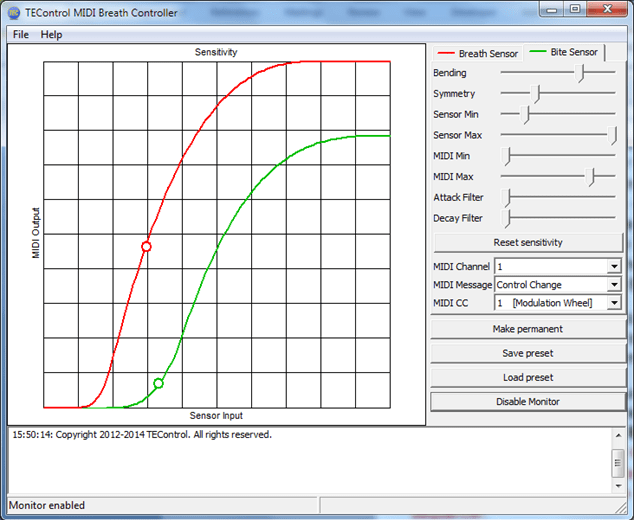 Following several requests to add a bite sensor to our best-selling breath controller, we are pleased and proud to introduce the new USB MIDI Breath and Bite Controller. 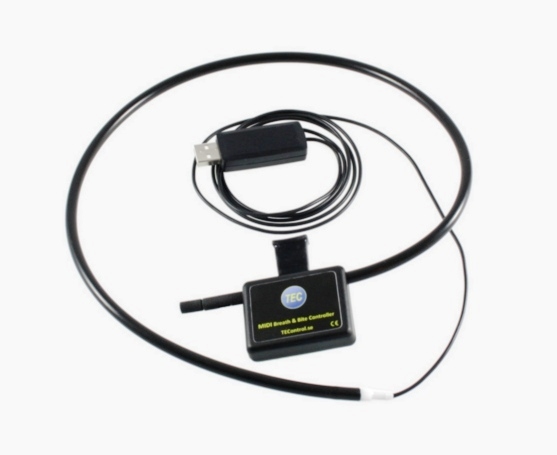 The USB MIDI Breath and Bite Controller adds another dimension to breath control and enables musicians and composers to achieve outstanding realism in their performance when using computer-based virtual instruments. With a second sensor integrated in the mouthpiece sensing lip bite force in addition to breath pressure, it is now possible to control any two parameters of your virtual instrument, for example expression/vibrato or expression/pitch. Our proven embedded signal processing algorithms guarantee full resolution over all sensor input ranges. MIDI messages are transmitted only when sensor data cause the MIDI output value to change. Thanks to the same state-of-art piezoelectric pressure sensor used in our earlier breath controller models, the latency is minimal and the response to breath pressure is fast and sensitive enough to even allow flutter tonguing. The USB MIDI Breath and Bite Controller is fully USB-MIDI class compliant and works out of the box with the built-in operating system USB-MIDI class drivers on both Windows and Mac computers, as well as any other class compliant host such as the Korg Kronos. The Configuration Utility works on Windows and Mac computers and allows easy and independent setting of parameters such as input/output range, sensitivity curve, attack/decay filter response as well as MIDI Channel, MIDI CC, Pitch bend or Aftertouch. The integrated headset can be bent to a comfortable shape and worn around either the head or the neck, depending on individual preference. The mouthpiece includes a comfortable food-grade silicon cover to protect the lip bite sensor from moisture and an adjustable air bleed valve similar in concept to that found on the famous – and now discontinued – Yamaha BC3 breath controller. This entry was posted in Hardware, Plug In, Samples Libraries, Software, Tutorial, Vst and tagged bite controller, breath controller, irig midi, midi, recensione, tec, usb. Bookmark the permalink.